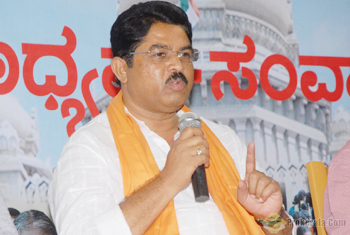 Udupi, July 28, 2015 : Speaking at the inaugural ceremony held to facilitate the newly elected gram panchayat members of BJP and programme to register new members of the party July 27, Former deputy chief minister R Ashok alleged that Congress-led State government is conspiring to destabilise panchayat raj system. He added the government is lethargic and sluggish. R Ashok said, "The chief minister is in slumber even in public and and he has lost control over his ministers and party men. The government is attempting all possible tactics to remove power of the gram panchayat which is at the bottom of a three-tier governance. Earlier, each gram panchayat was allotted 100 houses, at present number is reduced to 10. The housing schemes have proved to be utter failure and the government should clarify regarding funds allotted for various housing schemes." Holding the State government responsible for 150 deaths of farmers in the State, Ashok said government is nowhere seen attending to farmers hardships. He stressed that Rahul Gandhi ignores farmers suicides everyday. He asked why Rahul Gandhi is not visiting Karnataka. Ashok alleged that the government has not delivered incentives offered to milk and subsidy amount offered to the sericulture farming for past seven months. The prices for paddy and other horticulture crops have collapsed. Accusing Karnataka CM for siding with Lokayukta, Ashok defied that if CM is powerless to make Lokayukta resign, then he has no right to continue in power. Ridiculing the Congress government for lacking confidence to hold BBMP polls, he said Congress government has realised that people who brought the party to power have lost confidence and hopes. He challenged the government to come out with the truth or participate in public debate over its claim that the Centre is biased in releasing funds to State. The State has received Rs 1,60,000 crore under 14th Finance Commission. The gram panchayat election outcome in the coastal Karnataka is significant for forthcoming political scenario in the State. He asserted that majority BJP supported members in coastal Karnataka have won against their Congress. Our Politics is Corrupted. The Politician these days are busy pulling one another’s leg.